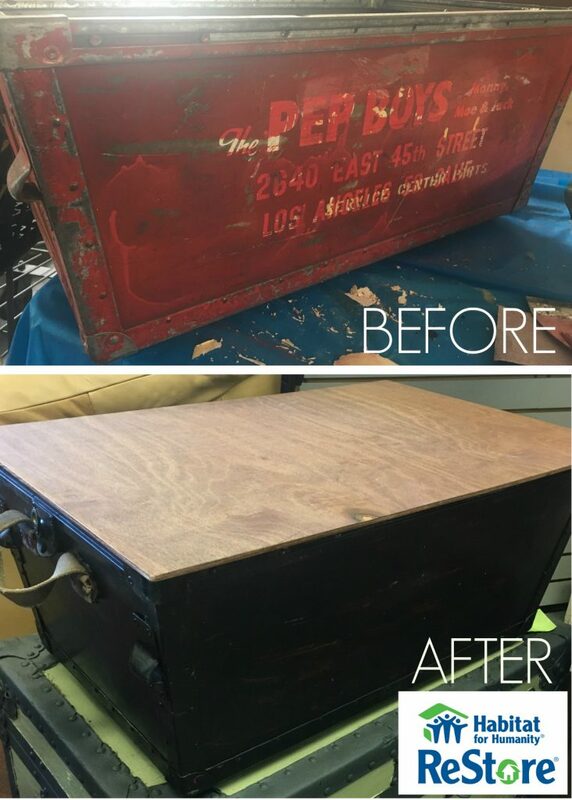 This week’s refurbish project is taking an old metal storage bin and turning it into a toy chest. This project is really cute and just the right size to add a Hot wheels course to the top. Measure top of bin for lid, adding ½ inch to each side for overhang. Stain lid and let dry. Mark on box where you would like hinges for lid. Measure length of screw so to not go all the way through the lid. Lay lid on box and mark where hinges will be on lid. Pre drill holes into box for hinges. Attach hinges to lid. Do not overtighten. This will cause the wood to split. Place lid on box and attach lid to hinges on box. They did not add a latch to the box. As it is being used as a toy box they thought it would be safer without a latch.